Next week is November, gang, and you know what that means? HOLIDAY. Christmas is only eight weeks away! Kinda scary when you put it that way, right? A couple of years ago when I did my first line-up of holiday content I was flying by the seat of my pants. There was little-to-no planning, and I really didn't have a vision. Last year, I promised myself that wasn't going to happen, and I was so happy with the content I was able to give my readers because I started early in the planning process. I even wrote a post similar to this one. So, let's hop right to it, shall we? 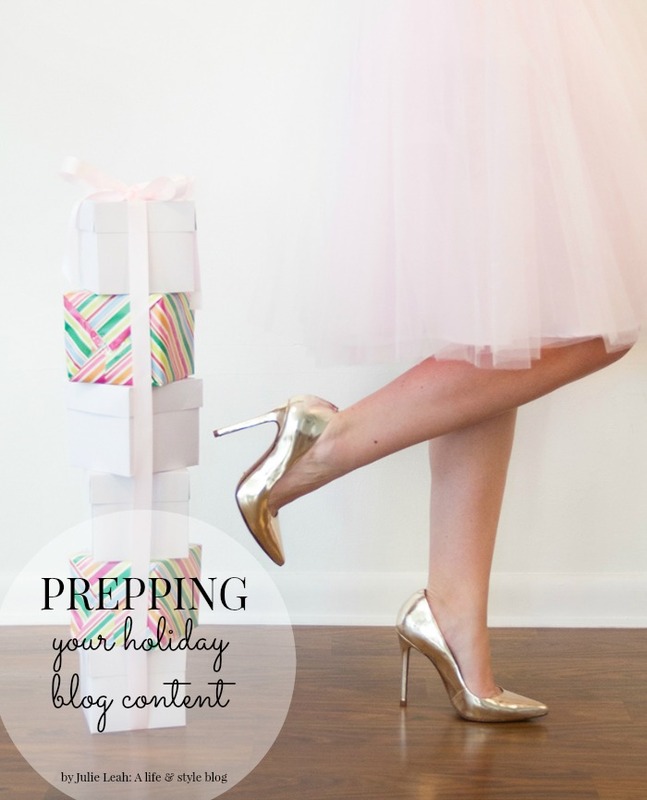 Here are my tips for creating the best holiday line-up for your blog. one // BRAINSTORM: Seems obvious, right? Write down every single idea that comes to mind that may interest you to share with your readers over the holidays. Don't leave anything off the table. This is the time to really get your creative juices flowing so think outside the box and dream big. If you're planning on doing any kind of holiday content, I would recommend starting this process this week if you haven't already. two // NARROW IT DOWN: Once you've gotten every idea down on paper, start narrowing it down to the ones that appeal to you the most, really speak to you, would be topics you would like to read about, etc. Remember - quality over quantity. There simply isn't enough time to fulfill every idea and make the content high quality. Narrow that list down to a few really great ideas and make them GOOD. So good your readers will look forward to your holiday content every year! three // MAKE A LIST: At this point, make a list of the holiday content ideas you're going to pursue and include details. Details are what makes every post come to life. There is nothing more that holds me accountable than making a list. There's also nothing that keeps me more organized. Once ideas hit paper and details are hammered out, there's no stopping you. four // START EMAILING: If your content includes collaborations with other bloggers and brands, now is the time to start emailing. You have your content finalized with details - now is the time to communicate with the people you want to bring on board to make the content shine. Also, if brands will be sending you items to feature in your posts, you have to allow time for shipping. In addition, if you will be working with a group of bloggers, allow for the time it takes for everyone to respond to email threads. Believe me, this step in the process takes longer than you would think. Never cut your time too close! Communication is key and remember to keep everyone in the loop at every stage of the collaboration. five // ALL THE DETAILS: Once you hear back from your collaborators, then it's time to start thinking about the little details that will make your content special. Are you doing a style collaboration? Start planning outfits and scouting photo locations. Are you doing a gift wrap how-to? Start pulling together the pieces you'll need to create unique packages. The final details are what keep your readers coming back for more! This is so helpful Julie!! Have already been stressing + this is a great reminder to get organized soon, and I especially have to remember quality > quantity. Thanks for sharing! Thanks so much for this! This is my first holiday season as a blogger, and I want to do it right!